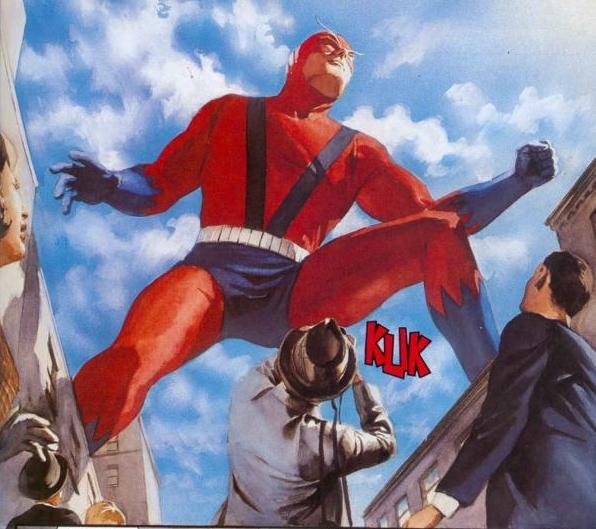 This is from Kurt Busiek and Alex Ross’ s Marvels. I remember seeing a version of this on the cover of one of the editions and just staring at it. And it was this panel that kept coming to mind when I was writing a story called “The Illustrated Biography of Lord Grimm.” The story’s told from the point of view of woman with no powers in a superpowered world, who works for the Dr. Doom-like character Lord Grimm. The superheroes invade her home nation, destroying the city she lives in — and the closest she ever comes to seeing one of these heroes is about the same distance as the photographer in this panel, the series’ non-powered point of view character, Phil Sheldon. No words in the panel. Nothing but a single special effect noise. But it says everything that needs to be said. I just wanted to point that out, and say, Thanks Kurt and Alex. And we nicked it (partly) from a Kirby panel, to boot!